Eggless lemon poppy seed muffins are a great addition to any vegan breakfast. They are not hard to make, freeze easily, and this classic combination is loved by nearly everyone. What Do Eggs Add to Muffins? Before you decide which method you are going to use for your muffins it is important to understand what eggs actually add to the muffin. You will probably want to experiment with your recipes and these substitutions until you get exactly the texture and flavor that you want. If you try a recipe once and it seems too dry, for example, try adding an extra tablespoon of fat for each omitted egg the next time you make it. There are several reasons for going eggless. Some people are vegan and choose not to use any animal products while others are only eggless because of food allergies and sensitivities. Following are some recipes that take each need into account. The following recipe for lemon poppy seed muffins has no animal products or by products in it. This makes it suitable for the most radical vegan. Makes 30 to 36 depending on size. They freeze very well. Although these muffins do not contain eggs they do contain dairy products and so are not meant for vegan eating. 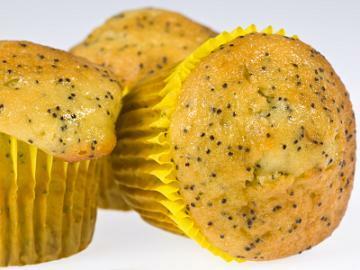 Eggless lemon poppy seed muffins are great recipes to have whether you cook for someone that doesn't eat eggs or you can't have them yourself. When you know what the eggs do and what items you can substitute for them you can easily remove or replace the eggs in any muffin recipe to make it egg free. By keeping these muffins in the freezer, along with other eggless breads you can have a quick, delicious breakfast in minutes. Make double batches while you are baking to save time during busy week days. Just be sure to wrap the muffins carefully to keep them moist and fresh in the freezer for up to three months.